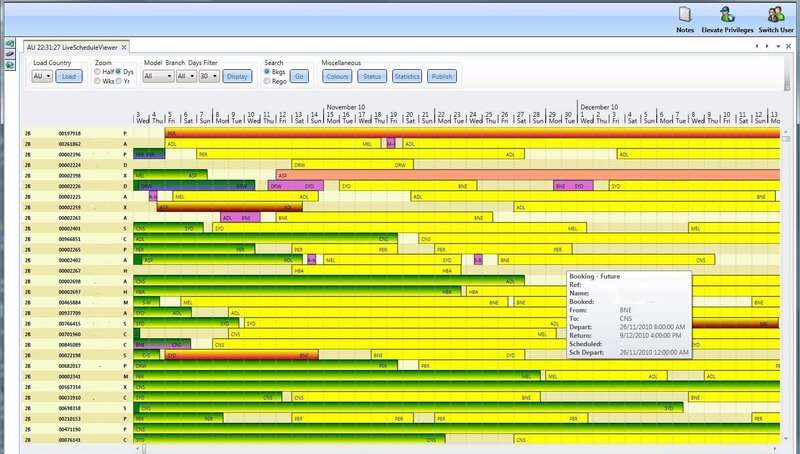 Scheduling engine used by VIBE to provide an optimised vehicle schedule and to maintain and determine fleet availability for proposed reservations. DVASS was written some years ago by CSIRO, Australia's national science agency. It was written for the needs of the recreational vehicle industry to improve on existing vehicle scheduling processes and to provide a globally optimised solution. It has since been reviewed and updated several times and was significantly modified for use with Vibe. For most successful rental businesses a large proportion of reservations now arrive via other systems, be they partner systems (using XML interfaces) or via the web. These fast-moving channels mean that reservation systems need to be able to decide instantly whether or not a particular reservation request can be satisfied. Gone are the days where customers consider it acceptable to wait hours or days to find out whether you can take their booking. Regardless of which Vibe inventory management module you choose, Vibe enables you to provide real-time availability answers to all your sales channels. Instant information and gratification encourages customers to commit to reservations. Reservations consultants maximise booking acceptance rates. ‘Last Vehicle Availability’ means significantly improved fleet utilisation compared with manual inventory control methods. DVASS can provide answers to requests for oneway rentals as easily as it can for round-trip bookings - if you allow them. That is because it is able to generate relocations to move vehicles from one location to another if required and if you have provided it with the relocation rules to do so. You offer a more competitive product. You respond more quickly to your customers. DVASS has a wide range of parameters that control how it operate. While most of these are technical they include such things as whether you will allow it to schedule delays and overnight delays in rental starts, and the proportion of its free time time DVASS spends improving various parts of the schedule during the day. You have more control over how DVASS works. DVASS can adjust your schedule to cope with a short-term fleet disruption without leving a booking completely unscheduled. DVASS allows you to operate a single fleet for an entire country or region. That is because it can schedule schedule one-way rentals and generate relocations to get your vehicles to where they are needed. These are done according to the rules you set up and taking into account the costs you set in your rules for doing these things. Better use of your fleet. Service more rentals with your fleet.